Shorty “J” reeving guides reduce the time and effort required to reeve a block by guiding the line easily around each sheave. The feature is especially valuable in crane rental operations, or conditions in which the line parts of a block must be changed frequently. 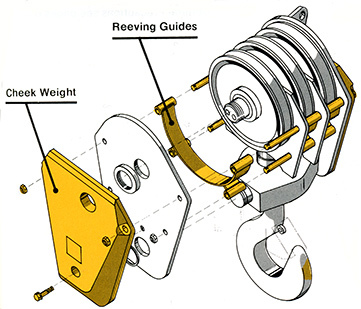 Johnson crane block reeving guides are standard on all new J-Blocks, and are available as easy-to-install field modification kits.